It is great to see that you are excited about adding running into your fat loss plan. You will definitely see some significant results. However, like everything else, there is a learning curve to running. You do not want your enthusiasm to burn belly fat to put you in a situation where you become injured or lose motivation. Both can easily happen if you are not mindful of what you are doing...and why you are doing it. I'll provide you with some insights about running and fat loss that I hope will help you be even more successful. First, let's clear up a misconception with a bit of reality. Please burn this into your brain: You can never just run-off (or exercise-off) belly fat. And secondly...just because you run doesn't mean you can eat anything you please. In order to burn belly fat significantly and see progressive results, you must start making good food choices. * The two biggest enemies you have when it comes to food selection are sugar foods and processed foods. * The sooner you get them completely out of your diet, and replace them with fresh fruit, vegetables, and solid protein sources...the faster you will see the fat melt away. * Learn how calories work. In order to eliminate belly fat, you must establish a slight calorie-deficit each week. Running will burn "some" calories, but the majority of your deficit will be from good food choices and portion control. * Running for fat loss means you'll need carbs, but make sure they are good carbs. The bad ones provide minimal energy and are too easily stored as fat. * Drink more water. Stay away from pop and especially stay away from "sport drinks" or "energy drinks." The benefits of drinking water are huge. * Although there are benefits of protein shakes, stay away from them for the first year or so. Get your protein from solid sources like turkey, fish, or chicken breasts. If you commit to conscious eating and making great food choices, you will be amazed at your fat loss results when you add in running. 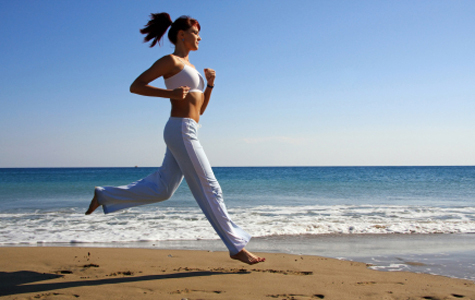 Running to burn belly fat and eliminate thigh fat must be done consciously and consistently. All too often, once a fitness strategy becomes routine, motivation begins to die. Don't let that happen to you. * Begin each run with a positive vision of you being fit, lean, and tight. See yourself having a set of great female abs. * Run consciously. Have a purpose for each run. It can be time, length, or intensity. Vary it each session. * Vary your surroundings if possible. Running in nice parks, along a quiet beach, or through neighborhoods with beautiful homes helps a great deal. * Running for fat loss is more fun if you have a partner to push you a bit. See if you can find one for one day a week, or see if there is a group to run with. * Run consciously. Learn about your body and your surroundings as you run. * Give thanks that you are becoming more healthy and more trim each day. Give thanks that you can see so many beautiful things along your way. Running to lose belly fat is an activity that needs to be monitored. You must start gradually and make increases progressively. Injuries are frustrating. Learn all you can about your body. Become the expert on YOU. 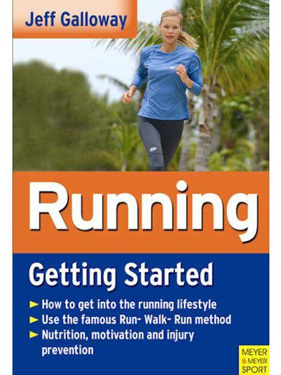 Running: Getting Started is possibly the best book you can find on starting a running program. Jeff Galloway is a thoughtful, intelligent, and insightful author who ran the 10,000 meters in the 1972 Olympics. His has a sincere writing style that is informative, enjoyable, and easy-going. * His book is both practical and easy to understand. It's best feature is his foremost motivational technique for keeping running fun and staying away from injury. * It is filled with tips and entertaining stories to help you reach your running goals with less stress. * The chapters are short. He also provides great color photographs, and excellent checklists to hold your interest. * He explains the mechanics of good form in a way that is both understandable and easy to replicate. * Jeff's whole intent is to make running for fat loss fun by keeping it safe, and adhering to sensible techniques and progressions. If you've tried running previously, or if you are just a beginner, I urge you to consider reading Running: Getting Started by Jeff Galloway. Thank you for visiting. I wish you much good luck in achieving a life without fat.